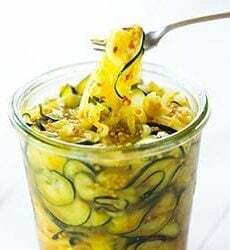 Looking for zucchini recipes to use up the rest of that summer bounty? These quick zucchini refrigerator pickles are sweet and spicy and perfect in place of regular pickles! ½ teaspoon crushed red pepper flakes optional - adds some heat! In a small bowl, stir together the water and kosher salt until the salt has dissolved. Place the zucchini and onion into a gallon zipper freezer bag. Add the water and salt solution, the ice cubes, and additional cold water to cover the zucchini and onions. Stir to combine. Seal the bag and allow to sit for 1 hour. Meanwhile, combine the vinegar, sugar, mustards, turmeric and red pepper flakes in a small saucepan over medium heat. Simmer for 3 minutes, stirring occasionally to be sure that the sugar dissolves, then remove from the heat and set aside. Drain the zucchini mixture in a colander and remove all excess moisture, either by putting it through a salad spinner or rolling it up in a clean kitchen towel lined with paper towels. Place the zucchini mixture in a large jar (or multiple smaller jars) and pour the pickling liquid over top, ensuring that all of the zucchini mixture is covered in liquid. Place the lid on the jar and refrigerate for at least 1 day before serving. The pickles can be stored in the refrigerator for up to 2 months.